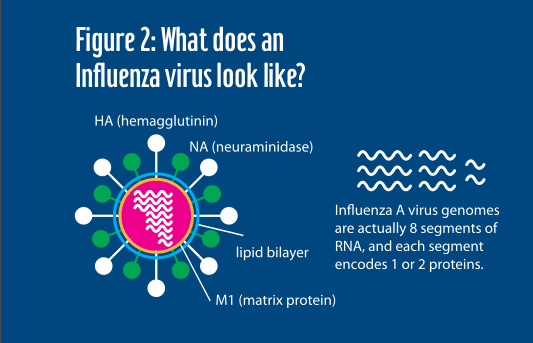 HomeVirologyWhat is influenza, anyway, and why is it such a big deal? Influenza is both the name of a disease and the name of the virus that causes it. The influenza virus’s life strategy makes it a serious threat, both to individuals and to the community. Learning a little bit about how the virus works will help you understand how it makes you sick and why getting a flu shot is so important. The influenza virus is extremely tiny. 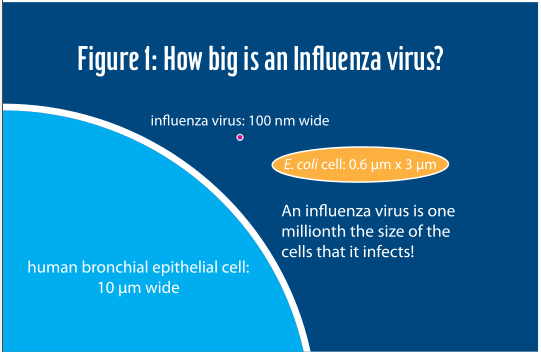 To an influenza virus, a human cell is the size of a small city. 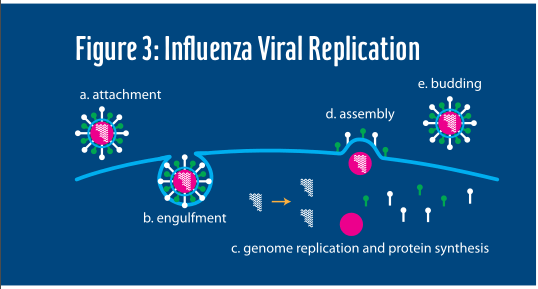 Hundreds of thousands of influenza viruses can fit in a single human cell (Figure 1). The surface of the virus is studded with proteins that recognize specific chemical compounds on the surface of the cells lining the inside of your nose. Once the virus binds to a host cell, it tricks the cell into letting it inside. Then it hijacks the cell’s own machinery to make more viruses and export them to the cell’s surface. Influenza virus stores its genome on eight short segments like miniscule chromosomes; each of these RNA segments is copied separately and complete sets are then packaged into new protein coats (Figure 2). Once the new viruses have reached the cell surface, they use one of their own proteins to cut themselves free from the cell surface so that they can go off and infect the next cell, or be sneezed out to infect the next host (Figure 3). This whole process — from entering your nose to releasing thousands of new viruses takes about six hours. Generally there is a gap of about two days between being exposed to the virus and showing symptoms: in other words, the virus can engage in several cycles of infecting cells and releasing progeny before you have any symptoms. By then, the virus may have spread to thousands of cells and infected many other people. Now you know why the influenza virus can cause such dramatic epidemics. It is a brilliant strategy from the virus’s perspective. For humans, it is a disaster — both for the individual (who will soon experience chills, body aches, fever, coughing, sneezing, and severe fatigue as the virus spreads to more and more cells and the immune system launches battle against it) and for the community, as the virus spreads, invisibly at first, from victim to victim. It is this stealthy strategy that makes the influenza virus such a serious public health threat. Unlike other viruses that are not very contagious, or cause symptoms that keep victims at home before they become contagious, influenza spreads quickly through a community and keeps spreading until it runs out of vulnerable hosts — in other words until so many people are home sick, or have already been sick, that there is no one left to infect. It generally takes a month or two for a wave of influenza infections to sweep through a community and once it gets started, there is almost nothing that can be done to stop it. Influenza is one of the only diseases that can shut down public services. Because the flu can spread so rapidly through populations, it can cause lots of people to miss work at the same time; staffing schools, hospitals, and police forces can become difficult.